Singapore - 20 September 2016 – Cargill and So Good Food, a wholly-owned Indonesian subsidiary of leading agri-food company Japfa, have entered into a 60-40 joint venture to produce and supply fully-cooked poultry products in Indonesia. The strategic partnership will leverage Cargill’s broad industry expertise to boost So Good Food’s capabilities in consumer food processing technologies, product innovation and quality assurance. Cargill and Japfa will also work together to produce a new range of value-added consumer food products. Besides toll manufacturing for So Good Food, the joint venture company, Cahaya Gunung Foods (Shining Mountain Foods), will supply high quality products to well-established and reputable quick service restaurants (“QSR”); hotels, restaurants, and the food service sector (“HORECA”); as well as convenience stores and petrol kiosks (“CVS”) in Indonesia. Cahaya Gunung Foods will also have the capability to export products to the region. 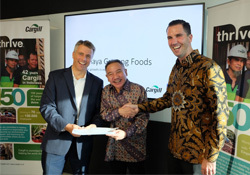 Derek Schoonbaert of Cargill was appointed Managing Director of Cahaya Gunung Foods and he stated: “Indonesia is an important growth market for Cargill. This is our first venture in the poultry business in Indonesia and we are excited to be partnering with Japfa. We will implement our world-class systems and processes to ensure high quality chicken products through our broad industry expertise and quality standards. Cahaya Gunung Foods will initially operate out of So Good Food’s existing value-added meat plant at Boyolali, Indonesia and take over the employment of the employees at the processing facility. Both companies will look to invest and expand the operations together, focusing on new premium products. Meanwhile, So Good Food will continue to operate its four meat processing plants in Indonesia, focused on producing downstream branded ready-to-eat consumer food products such as chicken nuggets, meat balls and shelf-stable sausages. According to Euromonitor, Indonesia is the largest foodservice market in ASEAN. The value sales for Indonesia’s foodservice market grew at a compound annual growth rate (“CAGR”) of 8.7% from 2010 to 2014, reaching US$36.8 billion in 2014, which was about US$14 billion higher than the next largest ASEAN market, Thailand. Full-service restaurants, fast food and street stalls/kiosks are the top three growth drivers for Indonesia’s foodservice market. The sales value of the foodservice market is estimated to increase at a CAGR of 9.0% from 2015 to 2019 to hit US$56.3 million by end 2018. “As the world’s fourth most populous nation, Indonesia’s foodservice market offers immense opportunities. Today, our So Good, So Good Sozzis and So Nice brands are already award-winning household brands in Indonesia for processed meats such as chicken nuggets, meat balls and shelf-stable sausages. Our JV with Cargill will take us a step further into new growth segments such as HORECA and CVS with a wider range of consumer food products,” concluded Mr Tan. Japfa Ltd is a leading agri-food producer focused on feeding emerging Asian markets. The Group produces protein staples such as chicken, beef and milk, as well as protein-based consumer food products. From its headquarters in Singapore, Japfa operates its businesses in the fast growing economies of Indonesia, China, India and Indo-China. Backed by two generations of farming experience, it operates industrial-scale farms which are vertically integrated with its downstream food processing operations. Cargill provides food, agriculture, financial and industrial products and services to the world. Together with farmers, customers, governments and communities, it helps people thrive by applying its insights and 150 years of experience. Cargill has 150,000 employees in 70 countries who are committed to feeding the world in a responsible way, reducing environmental impact and improving the communities where they live and work. For more information, visit Cargill.com. This press release is issued on behalf of Japfa Ltd by Kreab Singapore.